Last week at the MJBizCon, a major cannabis industry event held annually in Las Vegas, urban-gro launched the first technology line for cannabis growers utilizing Internet-of-Things (IoT). urban-gro, a cultivation technology company for commercial-scale growers, announced the launch of announced Soleil® Technologies, an integrated portfolio of hardware, software, and services that uses IoT. “The solution suite includes per-plant sensing, environmental monitoring, machine diagnostics, fertigation management, lighting controls, inventory management, and seed-to-sale tracking,” reads the press release. IoT is essentially a network of devices embedded with sensors and software that allow the devices to connect and exchange data. IoT devices are used extensively in the food industry, including for integrated pest management, restaurant food safety and management and tracking product conditions such as temperature and humidity throughout the supply chain, among other uses. Soleil 360 is the cloud-based software-as-a-service (SASS) platform that integrates all Soleil solutions. Soleil Sense is the brand for all of urban-gro’s low-power wireless sensors that deliver data with the scale, precision and resolution needed for analytics and machine learning. Soleil Controls is urban-gro’s product set for climate and irrigation controls, lighting systems, and other focused controls. The core, low-power sensor that makes this unique was licensed from Edyza, a wireless innovator that specializes in low-power wireless grids that scale. urban-gro then developed on top of that sensor, including its cloud-based management, analytics, what the sensors detect and cover, etc., to make it ideal for cannabis growers. 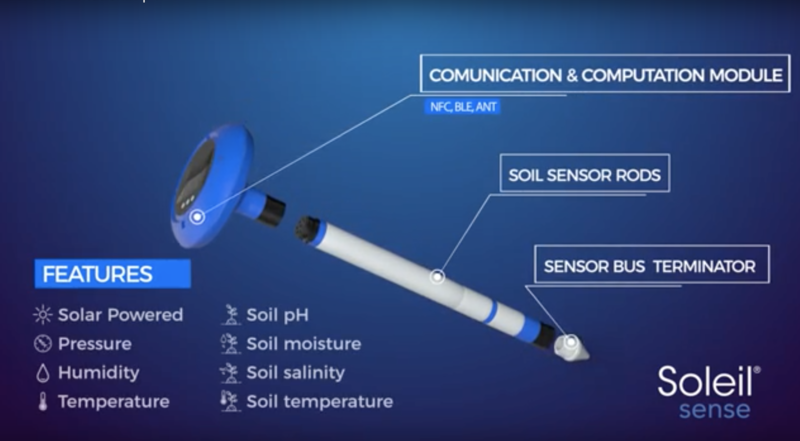 “Cultivators will be able to monitor substrate moisture and EC (electrical conductivity) levels on a per plant basis, as well as track key environmental metrics like temperature, humidity, air movement, and probability of infestation,” reads the press release. “With multiple device options, cultivators can choose between several deployment options.” With the data hosted on the cloud, users can access it through web browsers, Android and iOS devices. According to Jay Nichols, a representative of urban-gro, they have hired (and is hiring) code developers, product developers, etc. in order to expand this unit. Plant sensors are just one piece of the system, with the goal to automate the entire cultivation process, including controlling lights, pest management, irrigation and fertigation. They say it will be available in late Q1/early Q2. Opinions expressed the above syndicated article by Aaron Biros are for informational purposes only and not necessarily the opinion of Herban Medical Options.